From the website Ayudawp.com. Nice one! So which blogging platform is best? You know something folks, I really couldn't give a fig. And yet the chatter still rages on, incessantly, day after day, year after year, wasting so much energy and effort in between for so little gain. In fact, the Internet is full of it, some claiming this platform is the bee's knees and others saying that that one is, with both sides usually proffering some reasonable points, it must be said. But here's my take. It's the content, not the blogging platform, which we should be worrying about. You know, those pesky little letters making up words which you string into sentences in a bid to enlighten, inform or entertain. At the end of the day, that surely is all that matters. I mean, if the message is a strong one, is entertaining and/or informative, it'll get across. If it fulfils a desire or need, are you going to worry about the platform it's on? Hardly! Yes, I hear the chatter about presenting a professional, business-like image. And that's important, but up to a point. Let's face it, we've all seen those slick websites, filled with glitzy sales messages and pitches, selling this and that in a bid, ultimately, to prise from you some of your hard-earned cash. Probably some of you have even bought into one or two. But when you've seen one such pitch then you've probably seen a thousand. In the end it all becomes a bit of a turn-off. 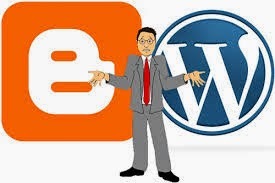 So, are you a WordPress blogger or a Blogger blogger. Or something else? Et moi? Blogger, through and through. Here's why. It's free. Who doesn't like free? Look, I could go on and on. But that last point is an important one, especially when it comes to cost. This blog, you may have noticed, has it's own domain name, purchased via GoDaddy for less than £1.00 ($1.46) for the first year, and just over £8.00 ($11.70) for the combined two years (which I went for). Talk about value for money! So, is it easy to set up a custom domain on the Blogger platform? Yes it is. It's simple. All I did was follow the excellent instructions on the Wonder Forest website. All worked first time and the URL was almost instantly available on the Web. Let me know what you think. Hey, you're even allowed to disagree with me. Come on, let's add our tuppence-worth to all of that inane chatter. You know you want to!